The oldest Madonna statue in the United States is La Conquistadora “Our Lady of Conquering Love”. She came to Santa Fe in the year of 1625 right before Christmas. She was brought by Alonso Benavides a Fransiscan from the New Mexico missions. She is a small wooden statue of Mary made of arabesques over gold leaf. She is dressed in clothing like a Spanish queen which was the style in those days. The year 1680 the Pueblo Indians had an up-raising killing 21 friars at the Santa Fe mission. The statue was then bought to El Paso del Norte in Juarez Mexico and given temporary housing at San Lorenzo. The year of 1693 Governor De Vargas reconquered Santa Fe under the protection of La Conquering or at least this is what it says in the guide books. …..It seems with the coming of the Spanish Conquistadors and Spanish Missions the yoke of suppression fell heavy on the Native American tribes in the New World. I like to take a moment to reflect on the name of the mountain range above Santa Fe which called “The Sangre de Cristo Mountains” which means the “Blood of Christ”. These mountains were Sacred to the Native Americans tribes. And their blood also became a the sacrifice with the coming of the new religion. If we could look deeper beyond the separation that played out between the Native American people and Christian conquers I would like to share a mystical moment I that happen to me a few years ago. Christ predicted before he died and said “Many will die in my name” The church refers to this statement as the blood of the martyrs…..but if one looks at Christ own words how many Holy Wars have played out over religion, politics and power? And how many people’s blood have stained this Earth over the separation that has repeatedly played out, down through history I do not believe this was the true purpose of the life of Christ. My path has been diverse this life I was raised as a devote Catholic as a child with both pray and devotion to the Great Maria…..But I also have a deep love for the Mother Earth. Later I found myself studying and working with with Native American Elders. This brings me to my mystical medicine story. I saw the boat people, the Europeans coming to the New World. They had carried the symbol of both the chalice and the cross….and the knowledge of the Father Spirit. Then I saw the Native American people, their spirituality was of the Mother Earth and they saw all living things as Sacred. When the two parties meet there was a karmic gift exchange. The chalice was filled with alcohol as their offering, “The Blood of Christ” alcohol was also known as fire water to the Indian people. The Native people had the sacred offering of tobacco which actually means ” Mother ” in Cherokee. The offering of tobacco was only used in the beginning as a communication to the Spirit World by the Indian people. When these two gifts were exchanged by the Boat people and Native Americans….something happened because of the separation between the Spirit of the Mother and the Spirit of Father….or in simple terms Spirit verse Mother matter. Symbolically speaking The chalice filled with fire water was poured on this Sacred land. It burned both the Earth and the Native People. Today the effect of this karmic gift exchanges have destroyed countless lives in the form of cancer and alcoholism and also impact of the environmental crisis. And just maybe the greater symbol of the Sangre De Cristo Mountains are the blood of all the people who have died both the suppressed and the suppressor. Our Lady La Conquistadora is said to be the conqueror of our hearts. The true quest is for each one of us to conqueror the separation we feel inside, the separation from Spirit and the body, Spirit and Nature and the separation we feel from each other as human beings. The church bell rings as I write this last sentence and my own prayer today is to conquer inside myself what separate me from love and human kindness. When I first arrived at the cathedral today the Madonna was not in her shrine it was empty. I sat in meditation for about a half an hour then all of a sudden a group of people came in out of nowhere and began singing Gregorian chants. The Madonna that wasn’t there, also appeared…most likely taking through the backdoor. 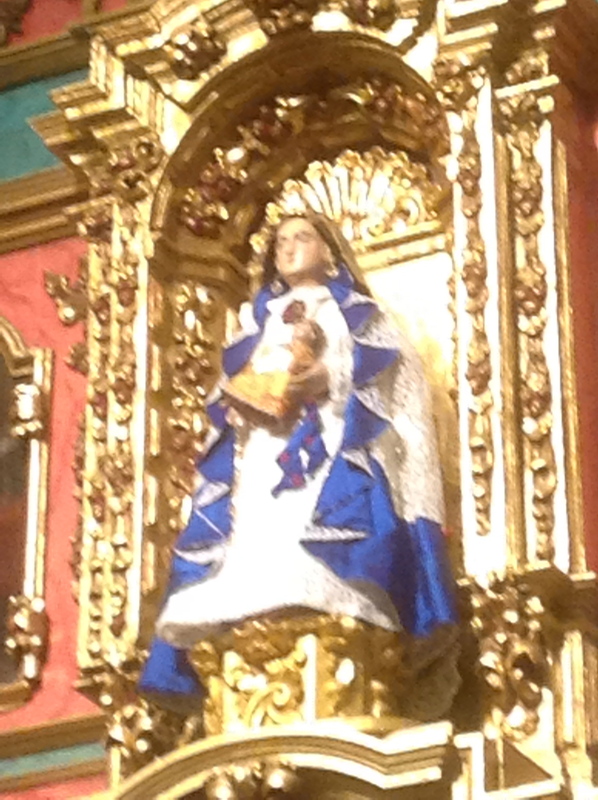 The choir moved toward La Conquistadora Shrine….and the Madonna was brought to the altar. She then was raised up on the High Altar. It was a beautiful moment to experience the chanting and the rising of the Madonna in her rightful position. Honoring both the Spirit and also the Spirit within the form. Maybe the symbolic poetry of this pilgrimage is first there was Emptiness and then there was Form. And both need to be seen as Sacred. La Conquestadora has had different titles through the centuries. She was known as Our Lady of Assumption, Our Lady of Conception, Our Lady of the Rosary and Nutetra Senora de la Paz “Our Lady of Peace”. 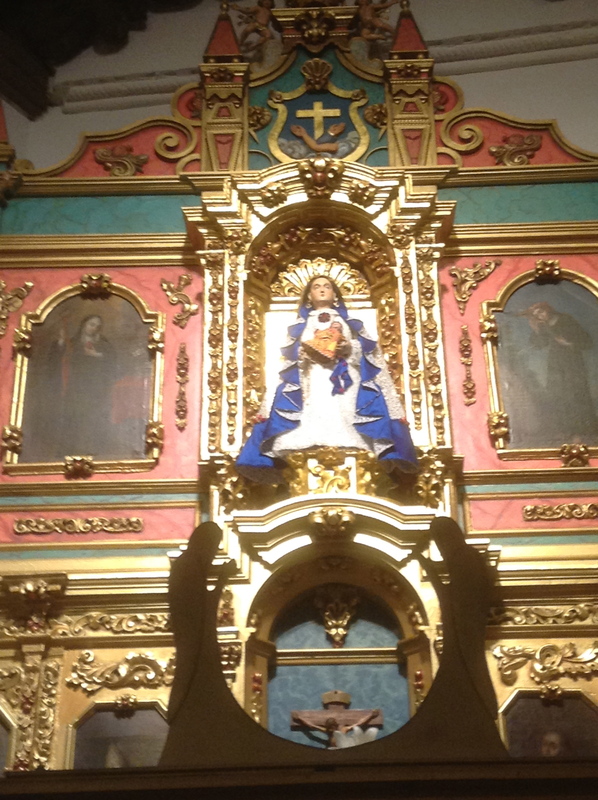 She first was brought to Santa Fe by the Franciscans. August 12 in the year of 1680 an Indian up rising occurred killing 21 priest and the burning the city. The church was set on fire but, La Conquestadora was rescued from the flames. The threads of this Virgin’s story being rescued from the fire….rings a bell in me, for is it not the Black Virgin that walks through the fire or is scorched by the desert sun? La Conquestadora’s history at this point is questionable. She could of originally been a Black Madonna. It is hard to know the exact history of this Virgin icon since many of the church’s records were destroy between 1697-1777 and the embellishment of the La Conquestadora’s story is mixed with deep devotion and historical facts. But it is said she went through a radical transformation under a woodworker’s knife. Originally she came from Spain about 380 years ago. She was made of olive wood. But also was reconstructed with willow wood by two different artist. The olive trees did not grow in New Mexico or Mexico and newly planted trees most likely would not be cut down. It is also said the original La Conquestadora had the appearance of a Moorish Princess dressed in a crimson red garments that were carved from wood and covered with plaster. Her was garments were edge in gold leaf design. When I hear the word Moorish Princess I see the dark skin of the Moorish people. This was a time in the history of Spain that a bridge was trying to be made between the Muslim invaders and the Christians. The icons of the Virgin Mary were being used to bridge the gap between two very different religions. Even to this day you can find that Spain has a tradition of Black Madonnas such as the Black Virgin of Montserrat, Lady Guadalupe of Caceres Province or the or Virgen de la Pena that has her home near an old Moorish castle. Angelico Chaves a Fransiscan friar 1910-1996 traces both the historical and devotional roots of La Conquestadora in his writings. He speaks of the original wooden robes were carved away from the Madonna like some kind of butchery. Her shape was altered and movable arms were added. And maybe it was during this transformation her dark Moorish face was white washed It was common place in the church to paint over Black Madonnas of Europe. This was done to Our Lady of Einsiedeln in Austria in 1798. She went into hiding when the threat of Napoleon’s army came into play. When the Black Virgin was returned in the year of 1803 she had been cleaned and whiten. She then was restored to her original blackness and returned to her place of honor. La Conquestador after her alterations then was dressed in ornate Spanish clothing, and given a crescent moon for her pedestal. We do not know when these alterations took place. In recent history a controversy arose with the Native people, that protested against the violence that such a name carried. To soften the blow she adopted the title of La Conquestador,” She who conquers the heart”. Recently she was given the title of Our Lady of Peace. This Madonna straddles between two worlds….which might be the symbol of her olive/willow wood body. Olive wood is the symbol for peace. Willow wood carries the symbol of suffering and sorrow. I feel it is through the peace we can begin to heal the gap of cultures and ease the suffering of our historical difference. Santa Fe has become a blend of Native American, Mexican, and Spanish, bloodlines which creates a rich culture of art, music and talent. She who conquers the heart through peace and through love will be the bridge between our cultural differences.